THE Federal Government and Abia State Government have signed Definitive Agreements for the project between the Enyimba City Economic Zone Limited. The signing took place at the Presidential Villa and the Federal Government was represented by Nigeria Special Economic Zone Company. President Muhammadu Buhari who witnessed the signing, commended the Governor of Abia State Okezie Ikpeazu for initiating the project, and thanked the host communities for their commitment to the project, saying that everyone should be more confident of the the success of the project since the Minister of Trade and Investments, Okechukwu Enelamah, under whose portfolio it falls, hails from Abia State. The President assured the people of Abia State and other Nigerians of the Federal Government’s support and cooperation towards similar project anywhere in the country. Buhari specifically commended Abia State Governor, Okezie Ikpeazu, and some private sector investors who initiated and midwifed the Enyimba city economic zone project. He said such initiatives were exactly what his administration was desperately looking for to create employment for the populace and boost the national economy. 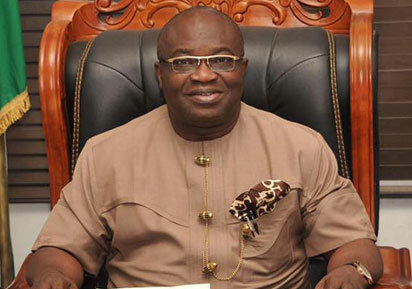 In his remarks, Ikpeazu, who led the delegation of leaders and stakeholders from the state, thanked the President for his support for the project, noting that Aba, a commercial city in Abia State where the project is sited, is strategically located for easy access from all Southeast and South-South States. He disclosed that Aba alone has over 250,000 artisans engaged in various arts and trades, and that the Enyimba City zone covers three local governments of the state. Ikpeazu noted that the project would not only be of immense benefit to Abia State but to the entire region and country. Professor (Eze) Maxwell Ogbulu, who spoke on behalf of the host communities, profusely thanked Ikpeazu for the project and informed the President that all the affected communities donated the land for it voluntarily because of the awareness of the enormous benefits to them and the nation. He thanked Buhari specially for finding it worthwhile to have the signing ceremony hold at the Presidential Villa and for his magnanimity in ensuring the project came thus far and for personally attending the ceremony. At the event were the former Senate President Adolphus Wabara; Vice-Chancellor of Abia State University; and some Abia State House of Assembly members, among others. On the government side were Enelamha; Governor of Central Bank, Godwin Emefiele; Minister of Information, Lai Mohammed and Secretary to Government of the Federation, Boss Mustapha. Abia State Commissioner for Lands, Survey and Urban Planning, Uche Ihediwa, signed the agreement on behalf of the State government; Mr. Femi Edun, Director of Nigeria Special Economic Zone Company, signed for the Federal Government; while Mr Darl Uzu signed for Crown Realities Limited, the private sector developer.